Char kway teow is probably my favourite noodle dish of all time. That’s a big call because I am a BIG fan of any noodles, and rice noodles in particular. I’m lucky because my volunteering at Fareshare takes me down Victoria Street in Richmond, which is Asian grocery central. It is a rare week that I don’t pick up some kind of Asian ingredient on my way home. Since becoming vegan I don’t think I’ve eaten char kway teow, as the classic recipe contains lots of meaty or fishy items as well as egg. I’d really consigned it to one of those things that I probably wouldn’t eat again. But last week on my way to volunteer, I noticed a trolley delivering fresh rice noodles to a Vietnamese grocer and I made a mental note to grab some on the way home. I wasn’t really thinking about char kway teow at all, just the rice noodles with something. But then I got a bee in my bonnet about char kway teow and decided I had to give it a try. I made a really simple version and I am happy to say that it was swoon worthy. I’m really delighted that the flavours in char kway teow don’t really depend hugely on the bits and pieces in the dish, but the sauces and the scorchingly hot wok. The dish is really all about the noodles. There are heaps of differing opinions on the web as to what goes in the sauce, but I’m really happy with mine which contained garlic, kecap manis, sriracha and light soy. It tasted just the way I remember it should, salty, sweet, savoury and hot. I added some bean sprouts, spring onions and mock vegan prawns from Vincents for a bit of texture. Prepare everything first, once you start you cannot pause to do anything because the dish will stew or burn. Heat the wok over a high heat, add the oils and heat until it smokes. Stir through the bean sprouts and serve. It is important to cook this for one, otherwise the wok just won't stay hot enough and the dish will stew rather than fry. 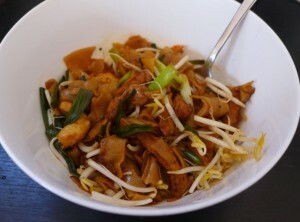 I’ve never had Char Kway Teow, but it looks great…and easy. I must try it. I like your tips about having everything ready and cooking one serve at a time. Very helpful for me. I have a feeling I’m usually stewing my noodles, I’d just never thought about that before.